Here, is a true piece of Canadian military equipment that will knock your socks off. This piece of equipment is not photographed in either of the major Canadian military web gear books including the epitomic Tangled Web: Infantry Accouterments 1855-1985 which cataloged all major infantry equipment used by the Canadian Army in one volume written by retired Brigadier General Jack L. Summers, nor does it appear in the more peripatetic '37 Web, Equipping the Canadian Soldier by the world renowned collector and active soldier Ed Story. I have had the distinct pleasure in communicating with both men on web subjects. This practical garment is known as the Battle Jerkin and was developed in 1942 by Colonel Rivers-MacPherson for the British Army. History has it that he disliked the Pattern 37 web gear in common use at the time and took the opportunity to design something he thought more efficient. 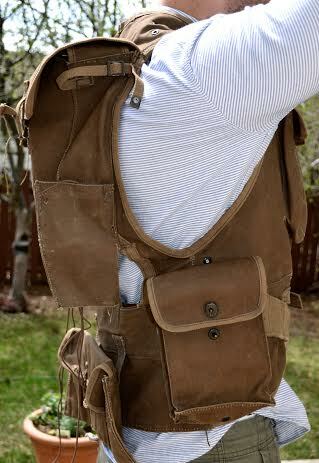 In reality, it was little more than a modification of early English hunting vests that featured multiple pockets and frequently occur on eBay. So he thusly copied it and designed it to replace the conventional P37 web gear then in general use. It was issued to assault troops for the Normandy landings and was used widely by commando personnel in 1944-45. A Canadian pattern battle jerkin was designed shortly after the British model in 1942. Over 1500 were produced and most were used by Canadians in the process of training in Great Britain. As the jpegs show it was made of a rich brown canvas material with an excellent edging of cotton brown tape. Much better made and constructed than the British version, it featured black enameled post and snap closures and buckles. On many examples these have rusted and deteriorated with time but on this one they remain crisp and ready for action. Few were issued and many were not used in battle which is why this particular sample is virtually brand new and was picked up in an army surplus store in the 1950’s for $9. For relevant stamps and markings, it is dated 1942, and marked size large and has a discreetly painted “O” inside the back indicating that the item was legally removed from Canadian government military stores and disposed of as surplus to government assets. All pouches feature a metal grommet located on the bottom of the pouch for drainage. My father was the original owner of this and I used it afew times for hunting. In fact if you have or come across copies of my book "Small Game and Varmint Hunting" published by Stoeger in 1989 you will see a couple of shots of me cavorting about the country side using this vest. 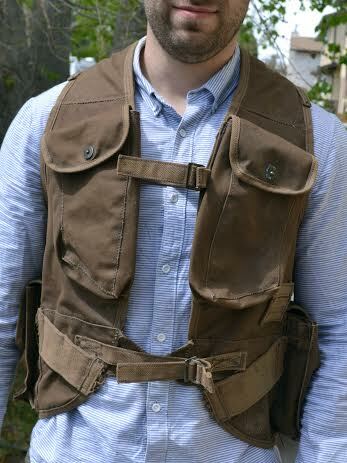 According to Rene Chartrand, writing in The Canadian Forces in WWII by Osprey Publications these vests never saw use in the European theater of war as it was too hot to wear when loaded with gear. There was a British reproduction model available from Pegasus Military that sold for 245 pounds but it wasn't quite a faithful copy. At the time I sold it, the canvas still had that new waxy smell. 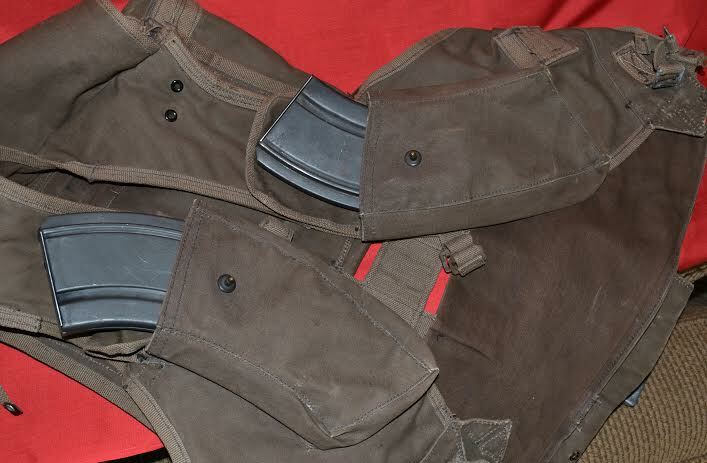 Clearly, the battle jerkin was ahead of its time as it has pouches that effectively replaced the universal or basic pouches of the Pattern 37 for Bren gun clips. There are two bomb pockets designed to carry two inch mortar rounds or two Mills bomb grenades. There are web tabs with slots to fit any SMLE bayonet and a special sleeve for the No 4 bayonet on the left bomb pocket as well. 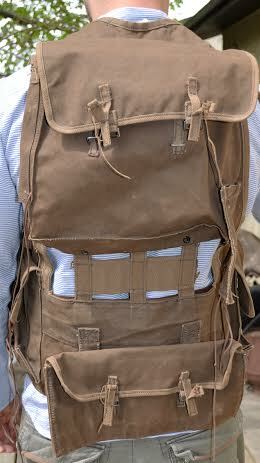 The rear pack was designed to hold a gas cape, ammunition, rations, mess kit along with a fork, knife and spoon. 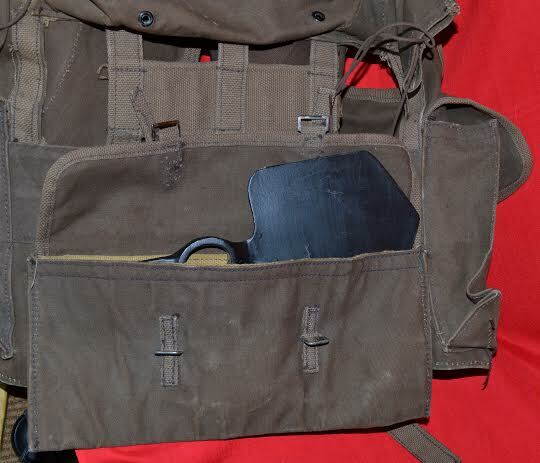 There is a sleeve for the machete on the rear pack that will also fit the two inch mortar barrel. On the opposite side, there is a sleeve to fit the entrenching tool handle. 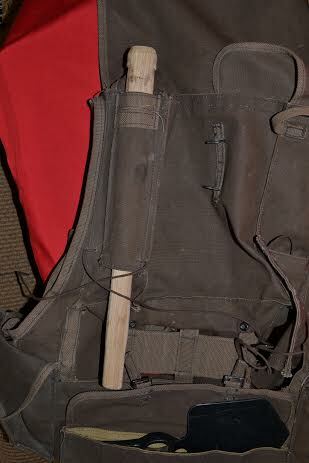 A special lower pouch suspended by three tether straps holds the entrenching tool. 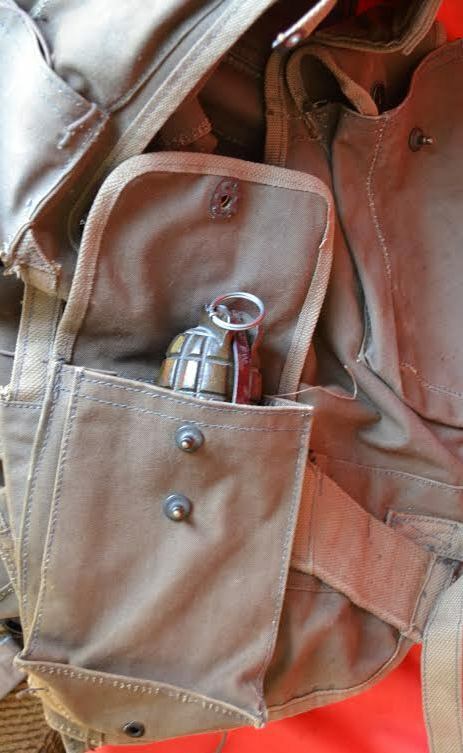 Inside this pouch there is a divider that was to separate soft items from the entrenching tool and provide a seat for the wearer to sit upon during rest breaks. 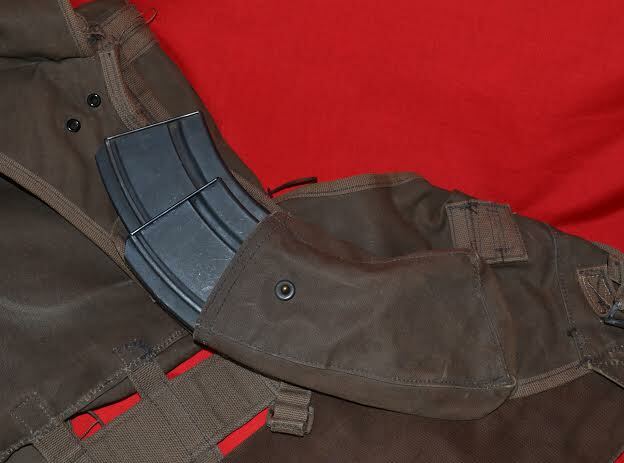 Finally, web belts sewn to the outside of the jerkin allow the user to fit any other item of web kit like a holster or an additional Bren pouch or compass pouch. It was truly, a system ahead of its time. Having outlined all of the above, I am not sure that I would have enjoyed carrying all that stuff. Enjoy! Glad to see you made it on here Wilf...I've noticed no pics yet. The pic uploading here is not the easiest to figure out, but it is remedied with a little practice. I think this is the item that is being discussed. The Canadian manufactured 1942 Pattern Battle (Assault) Jerkin was not mentioned in 'Tangled Web' as at the time that the book was written, no-one knew or recognized the existence of a Canadian manufactured version of this vest. Since my book '37 Pattern Web' only covered Canadian manufactured 1937 Pattern web equipment, I naturally did not devote any part of that book to this Jerkin as my intent was to write a separate book on this piece of equipment and if you look at the Service Publications website you will see that I have an upcoming book to be published on the topic of Assault Vests. As was mentioned previously, only 1500 examples of this Jerkin were manufactured with 1000 going to the UK for trials and 500 staying in Canada. The Canadian Jerkin was not employed on operations but the British version saw limited Canadian use on D-Day by some of 3rd Divisions assault formations and in July 1944 by RCN Beach Commando 'W'. The 500 vests in Canada saw use during numerous winter equipment trials and they were eventually declared surplus in 1956. The Canadian made jerkins were of a similar cut and design to the British version although instead of wooden toggles and string loops the Canadian version uses U.S. style 'Lift-the-Dot' fasteners. The U.S. also copied the British Battle Jerkin and manufactured their own version of Assault Vest. This vest is a rare item although at least half-a-dozen of the Canadian jerkins are known in private collections. I would be interested to see the example that Wilf has turned up. Yeah I forgot about the picture upload delay for new members. It does give me an option to bypass but it isn't working obviously. Wilf is going to send me the pic and I will upload it. I have never seen these jerkins before. The 'world renowned collector and acive soldier' Ed Storey, has written this for collectors. I hope to get it to press this summer. I would do it earlier but have three other books in the queue. This jerkin is awesome! A lot more to it than the British version. servicepub wrote: The 'world renowned collector and acive soldier' Ed Storey, has written this for collectors. I hope to get it to press this summer. I would do it earlier but have three other books in the queue. Awesome! Looking forward to it. Thanks to both of you for making this available to us.